In this enlightened age, women are supposed to have bigger stuff to worry about other than the size of their engagement rings, and many savvy ladies have come to the conclusion that bigger isn't necessarily better when it comes to that piece of meaningful bling. 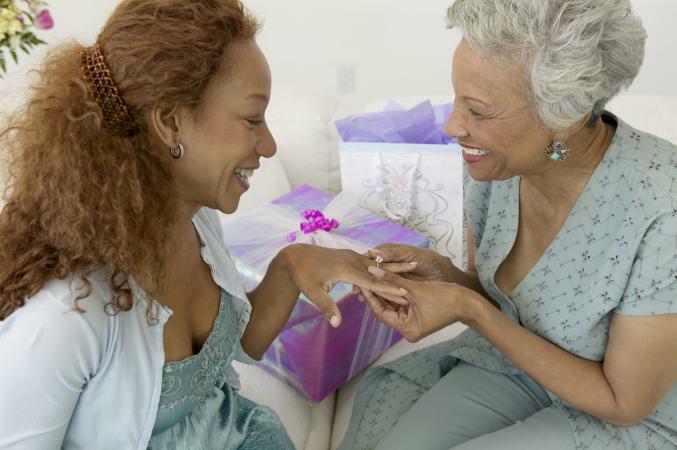 If you're wondering whether a smaller ring might be for you, keep these reasons in mind. Remember that ad that implied if a man didn't forgo stuff like eating, paying bills, and generally having a life for two months in order to scrape together enough money for a ring, he was essentially a dirtbag? Luckily, things have come a long way since then. There are a lot of expenses that come with starting a life together - think down payment on a house, saving for a family, and paying off college debt. These days, many couples find it unwise to tie up several thousand dollars in a piece of jewelry. In fact, one in three Americans now believes that you should spend less than a thousand dollars on a ring. A big ring sure didn't translate into together-foreverness for Brangelina - or for most celebs, for that matter. Surprisingly, the same may be true for regular folks as well. In fact, a recent study found that smaller rings might just indicate more marriage success than a huge rock. The researchers found that men who spent between $2,000 and $4,000 on their engagement rings were 1.3 times more likely to get divorced than men who spent between $500 and $2,000. You probably already know that spending a big chunk of change on something can up your stress level, but the same study that examined ring value and marriage length also looked at the anxiety of the bride. Women with more expensive rings were two or even three times as likely to become very stressed about the cost associated with a wedding. If you'd prefer to stay relaxed and enjoy this important time in your life, choosing a smaller ring might help. A smaller rock definitely won't keep you up at night. It's not uncommon for a large diamond to stick up several millimeters above the band of the ring. This height depends partially on the setting and style of the ring, but it's also a factor of the stone's size. For some, this may not be a problem, but if you work with your hands, a small ring may be a much better choice. Whether you use your hands for hobbies like gardening or stained glass or your regular job requires a lot of hands-on labor, your ring can get damaged. Diamonds may be the hardest gem on Earth, but they are not indestructible. A sharp strike against something can cause a chip or fracture. Save yourself the headache and keep it small and simple if you plan to wear your ring while you work. You've seen women get engaged and flaunt their ring for everyone to see. Showing off is fun if you have that kind of personality, but many people prefer to keep a lower profile. If this is you, you aren't alone. Up to 50 percent of the population are introverts, who often dislike being the center of attention. That's totally acceptable, and you should choose a ring that fits who you are. A smaller ring can be lovely without shouting "look at me" to everyone who passes by. The gem is only part of what makes an engagement ring beautiful. You may not be into a big diamond solitaire in a simple setting, and that's okay. A gorgeous engraved setting or one that features delicate filigree doesn't need a big stone; in fact, a large gem can even fight for attention with the lovely metalwork in your ring. If you're dreaming of a lacy, pretty ring like this, the gem just isn't as important. You may pay just as much for a custom ring with an elaborate design as for a large solitaire, but that money will go toward something that reflects your personal style. When Amanda Seyfried got engaged in 2016, she didn't opt for a huge rock to tell the world the news. Instead, she chose a simple and very delicate gold band. This set off a flurry of criticism from tabloids and social media, but the little gold ring is a classic choice for a bride to be who doesn't need to show off. If you're in this camp, a little ring like Seyfried's might be ideal. Don't automatically assume a big ring is right for everyone; it's all about scale. 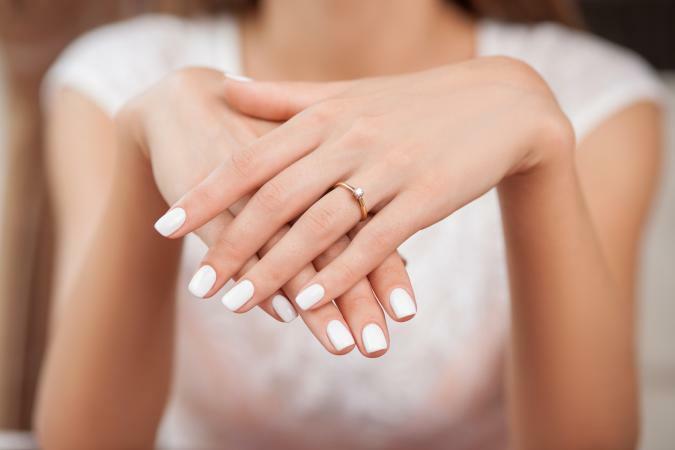 If you have delicate hands, a huge engagement ring can look clunky and out of place on your finger. You may look much better in a slim band with a tiny, sparkling gem. Take some time to try on smaller rings. After all, this is a piece of jewelry you'll be wearing for the rest of your life, and it's unlikely the size of your hands will be changing in that time. Anyone who is familiar with the 4 Cs knows that carat size is only one factor in choosing a diamond. You also need to consider clarity, color, and cut, and all of these factors have an effect on price. A large diamond with lots of inclusions, a poor quality cut, and a yellow color may be worth considerably less than a near perfect gem that's a fraction of the size. Understanding the relationship between quality and price is important. There's no shame in wanting the highest quality diamond you can afford, even if that means the stone is smaller. Your small diamond will make up for its size with extra sparkle. The heirloom ring is possibly one of the best and most heartfelt reasons to embrace the small engagement ring. Say your fiancé's great-grandparents were Depression-era survivors who scrimped and saved for everything they had. A tiny gemstone ring is a result of their tenacity, has been passed down for generations, and provides a perfect symbol for what you hope your love will represent. Wear your heirloom engagement ring with pride. It's about history and what your family values, and that's much more important than size and price. Whatever reason you have for choosing a smaller ring, don't apologize for your decision. You may run into people who don't get it and indicate judgement, but that's more about them than it is about your ring. As long as your ring represents your personal style and the person you love, it's going to make you happy for decades to come.